Hello friends! I'm sharing bits of my latest flea market forage with you today. Nothing beats the winter blahs like a cart full of pretty! By now you know to look for the usual suspects from me. . . . But I get more selective in what I pick these days. In a way, a doily is just a doily, but I love how this one almost looks like tape lace (like Battenberg), and I've never seen one like it before. I was very lucky to finds these items over just a couple of trips in and out of two different markets. It really is mostly about random timing. But I love the hunt. That pretty little vanity mirror was five bucks too. Everything first lands in the guest room/nursery where I test drive things. I don't think I would want anybody to sit on this adorable French-y caned bench, but it makes for a fabulous little tea table. I like how sweet it all looks with new things just being brought in and plopped down together. 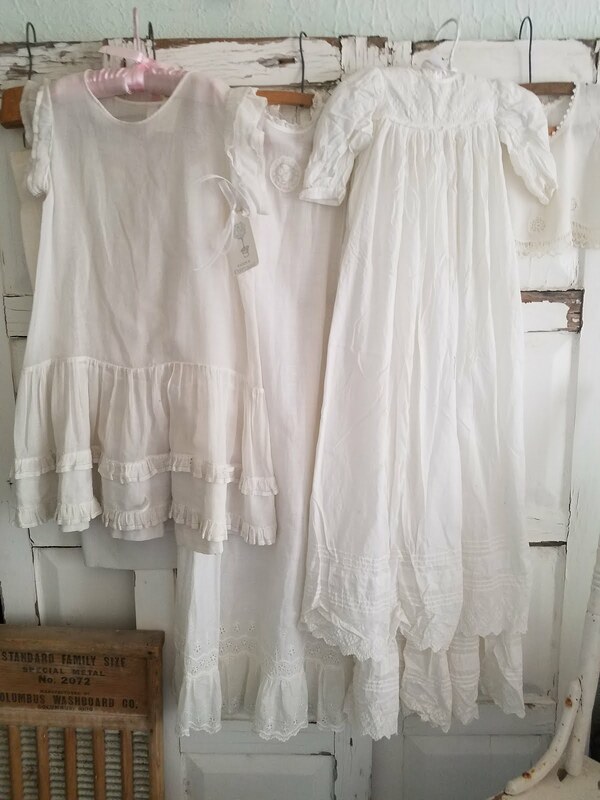 Now I have to tell you that I long ago stopped buying random baby dresses whenever I see them, (hard as that can be). But this sample reaches the "collection" threshold because of its tatted lace details. Besides the beautiful lace work, the hand made stitches are also plain to see. I love vintage clothes that have a little color of age and a bit rumpled, so I probably will leave this as is for now. So plain and honest and lovely. Two different buttons on the back. The sewer likely used whatever buttons she had available. Another pretty doily big enough to be of real use somewhere. A great look for this Pottery Barn jar for five dollars. . . . But it just can't compete with this grand old china pitcher with its now secret past. Crazy for monograms! This set of two matching towels was four dollars. They will look amazing all freshly washed and pressed. Just look at this beautiful floral ironstone cup and saucer! Still together after all these years. I'll drink to that! Four dollars. The sweetest little lady in that chippy cream frame. Now these are ancient original prints in lovely gold frames. About 8x10. They read "January" and "February," and will look luscious on my sitting room wall with other old prints. Five dollars each. The old tones should warm things up. Pulled thread runner in pristine condition. Don't we love these little metal garden chairs? This one has just three legs. A tall and handsome plaster candlestick was a bit of a splurge. This biggish ornate and tarnished silver plate bowl was seven and change. Let me count the ways. Maybe with a glass dome? I am not supposed to be buying these wonderful old hand crochet tablecloths anymore, but just try to stop me!!! LOL! I really have not kept many... They just feel like love to me. A net lace tablecloth is a different kind of wonderful. So beautiful, but more common to come across. I have had many of these pass through my adoring fingers. I hope you enjoyed the show and tell!